Acquired, generalized hypoactive sexual desire disorder (HSDD) in premenopausal women and is not due to a coexisting medical or psychiatric condition, problems within the relationship, or adverse effect of a medication or other drug substance. Not for HSDD in postmenopausal women or men. Not for sexual performance enhancement. 100mg daily at bedtime. Discontinue if no improvement after 8 weeks. Concomitant alcohol, moderate or strong CYP3A4 inhibitors (eg, azole antifungals, clarithromycin, nefazodone, ritonavir, saquinavir, nelfinavir, indinavir, boceprevir, telaprevir, telithromycin, conivaptan, amprenavir, atazanavir, ciprofloxacin, diltiazem, erythromycin, fosamprenavir, verapamil, grapefruit juice). Hepatic impairment. Hypotension. Syncope in certain settings. Increased risk of severe hypotension and syncope with concomitant alcohol use. Assess patient's likelihood of alcohol abstinence prior to prescribing. Increased risk of CNS depression if taken during waking hours. Conditions that predispose to hypotension. CYP2C19 poor metabolizers; monitor. Pregnancy. Nursing mothers: not recommended. See Contraindications. 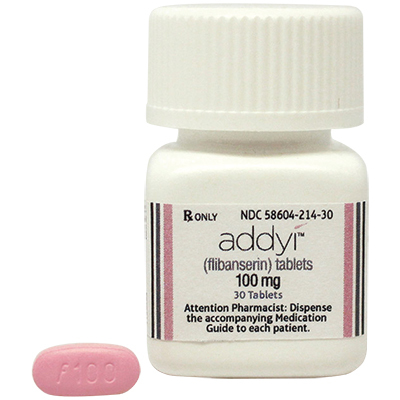 Increased risk of hypotension and syncope with concomitant moderate or strong CYP3A4 inhibitors, if use necessary, discontinue Addyi at least 2 days before starting the CYP3A4 inhibitor; discontinue the CYP3A4 inhibitor for 2 weeks before restarting Addyi. Increased risk of CNS depression with alcohol, other CNS depressants (eg, diphenhydramine, opioids, hypnotics, benzodiazepines), or strong CYP2C19 inhibitors (eg, PPIs, SSRIs, antifungals). Potentiated by weak CYP3A4 inhibitors (eg, oral contraceptives cimetidine, fluoxetine, ginkgo, resveratrol, ranitidine). Antagonized by CYP3A4 inducers (eg, carbamazepine, phenobarbital, phenytoin, rifabutin, rifampin, rifapentine, St. Johns wort): not recommended. Potentiates digoxin, sirolimus, other P-gp substrates: monitor levels. Dizziness, somnolence, nausea, fatigue, insomnia, dry mouth; hypotension, syncope.